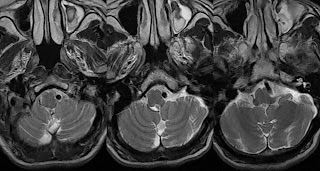 MRI Brain Axial T2w images at the level of medulla show tortuous dilated left vertebral compressing left half of medulla. Tortuous intracranial arteries in the subarachnoid space may compress and distort the brain parenchyma, can cause direct compression or stretching of the cranial nerves. Most intra cranial arterial compressive lesions are associated with dolichoectasia of vertebral-basilar system. Compression of the medulla by dilated and tortuous vertebral arteries is rare and is a less well known clinical entity. Compression most commonly occurs at the ventrolateral surface of medulla. 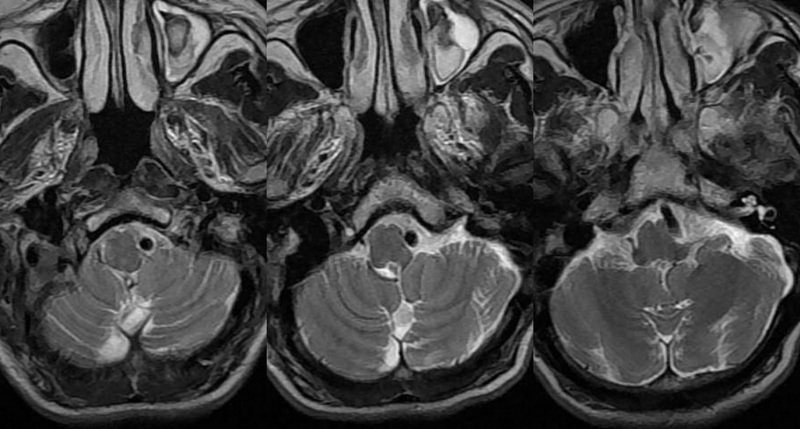 The clinical features can be transient or permanent, can be motor, cerebellar or vestibular. In most of the cases poor correlation exists between the clinical findings and the severity of compression. In some cases it may not match at all to the patient’s clinical features. Please dr Anvakar, could this be the same thing?